First thing to do is pull out all the sweaters. I keep mine on the shelf above the hanging bar. wash or have cleaned the ones that require such. with a few drops of cedar oil on the wool dryer balls. I wipe it and the hanging bar with cedar oil as well. 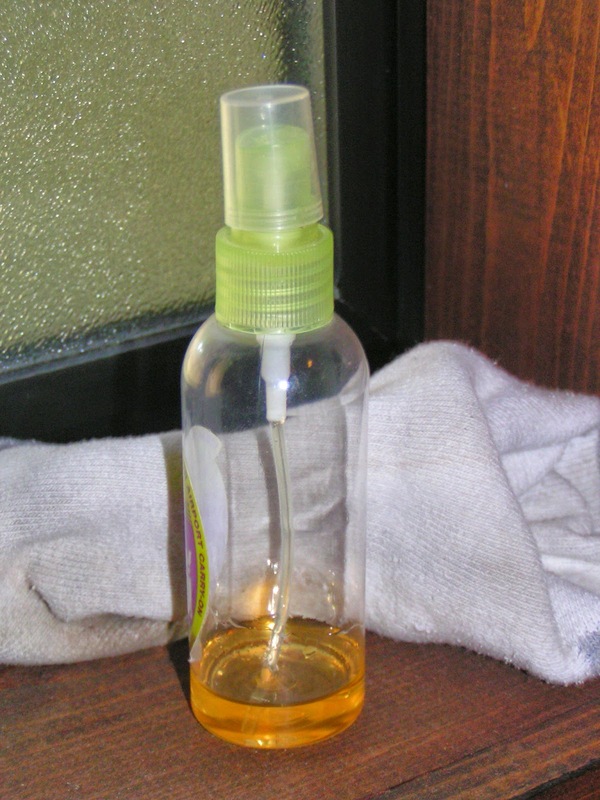 I just got a little spritz bottle and keep the oil in it. I use an old sock so if I feel like the oil won't wash out very well, I can just throw it away. through my clothes and pull what I haven't worn, what might not fit well, and what is so uncomfortable I cringe at the thought of wearing it. hung them on one end. A couple of the items, I have decided to keep, but at least 95% of them have gone to the bargain counter. I do still have a few things to try on. I have come to the point that 'if I don't wear it, I don't want to store it. 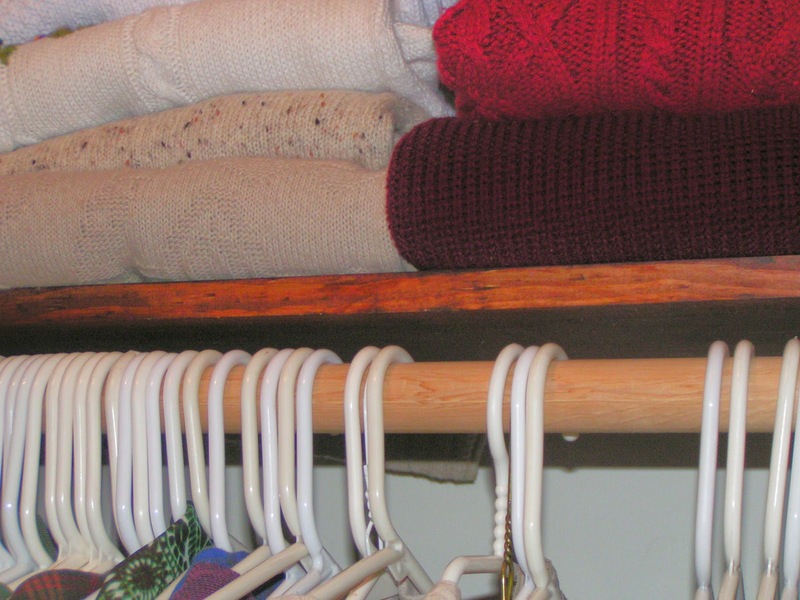 My sweaters are now all organized and folded nicely awaiting next fall. The closet smells fresh and clean when we enter - don't you love the smell of cedar? we were always searching for an empty one. and keeps me from 'acquiring' too many items I don't wear. It's a reminder every time I consider bringing home more clothes. I think, "Will I have to try it on and pass it on in the spring?" My reply to myself is usually, "Ugh," so I pass. I would also like to apologize for my absence. My computer did a sorta crash. just to turn it on. for the work load of a 'real' computer. I will attempt to limp along. Good Morning, It is really suppose to be spring, but it is cold and we have snow plus some black ice in places. Needless to say I am staying home. I am trying to catch up with my friends this morning. I know about computer crashes not fun. I brought back out my winter sweaters today and to think Sat was 81, Sunday 71 before it started going down hill. Have a wonderful day. Hugs and Prayers from Your Missouri Friend. Maybe you'll get a bigger tax refund than you expected. I love going through all the nooks and crannies to clean out like you did. I won't be able to do that for a month or so because of certain circumstances but I can't wait!!! It gives me joy! My computer crashed too last month. It will take a 5 hour trip to get it to a repair place so it has been sitting for over a month. I sure miss it and am on an old one too... Sometimes we just have to limp along with what we got! :) Take care! such a spring clean your wardrobe has had, i should follow your good example as I have loads I do not wear, seem to like the things I have had since late 80`s and early 90`s ( they have all seen better days) more than those I have bought recently. Computers can be a pain, mine is playing up too, will not accept either the printer or my tablet, samsung are taking control of it this morning to try and find what is wrong, amazing they can do in on line and not have to come here, bet of all it is free.